Changes: I think Jason Perry is having a good enough AFL campaign that he is in danger of being claimed, so I project him to replace Chris Dunwell on the projected 40-man roster. Perhaps more likely is that neither is on it and the A's sign someone, maybe a 6-year minor league free agent (if you're bored, the list is here.) Also, the A's didn't put Shane Bazzell on the 40, making him a 6-year minor league free agent; the newly signed Seth Etherton (why?) will fill that 40 spot. Small sample size AFL news. Omar Quintanilla continues to be very impressive, .387/.435/.552 with only four strikeouts in 62 at-bats. Street continues to mow people down; he's now pitched 14 innings, striking out 15 while walking one and allowing one earned run and nine hits, no homers. Perry continues to slug but on-base just .327, Jeremy Brown had two good games, Baker has regressed a bit, Obenchain has pitched well since a horrid start. This assumes the A's offer arbitration to all arb-eligible players and don't sign any free agents. * = not yet on 40-man roster. I found a way to post pictures. I am not sure how often I'll use it, but it might make looking at this blog a little more fun. Here is my first picture. Stats aren't just for baseball. I went to US News and World Reports website to look at the top 50 American Universities. I found that if you live in a state with one of those 51 (tie for 50th) schools in it, chances are 36-15 you live in a state won by Kerry. If you look at Wired Magazines Wired 40 "masters of innovation, technology, and strategic vision - 40 companies driving the global economy", you'd find that those companies are located in a state won by Kerry by a margin of 23-5 (12 are overseas). So if you live in a state with a top school or a top company in it, your state voted for Kerry. If you live in a state without a top school or a top company, your state voted for Bush. Can any conclusions be made from those stats? As a guy that likes to make over the top statements, I was a stunned to hear him say that. Was this the best thing that has ever happened in sports? This guy, like me, didn't sound like he was from Boston, he just got caught up in the story of the Red Sox. It wouldn't be wrong to say it was the greatest comeback in the history of sports. Once they got to the brink, down 3-0, they never lost again. 8 straight wins against the best teams that MLB could throw at them. Having the comeback be against the Yankees and winning game 7 in Yankee Stadium with all the subplots was pretty incredible. There are a lot of sports stories talking about when the momentum shifted, in ESPN the Magazine, Buster Olney makes the case that the momentum shifted during the game 3 19-8 loss when Wakefield volunteered to give up his start to save the bullpen. Bill Simmons at ESPN.com said it was in the late innings of game 4 when the fans at Fenway stood and cheered as their unreliable pitcher, Derek Lowe, went to the bullpen to warm up. I don't think fans believing could have helped, but them cheering probably could have. I am starting to question my understanding of what I saw, maybe there isn't any momentum, maybe a bunch of Red Sox who normally would have given up decided not to this time, and a bunch of good breaks randomly went their way. But I believe by the time the Red Sox had won game 7, they could have beaten anyone 4 straight games, the Cards, the Yankees, an NL all star team, they were on the roll of a lifetime. The greatest thing that ever happened in the history of sports? Yeah, why not? Here is one more funny Red Sox link. So that's it, no more blathering about the Red Sox from me. 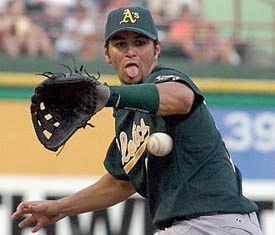 The A's look like they will be in great shape for next year. I can't wait to see another full year from Crosby and Harden and Swisher and Blanton. There must be some moves coming. This year has proven that anything can happen. I don't suppose we can find the next Keith Foulke?